Another week has gone by and finally able to post again. Yesterday I played with some new CC Design stamps that the store just got in. I have so much to learn on coloring with copic markers. I really enjoy making these half cards. 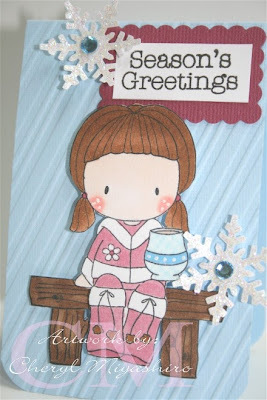 I embossed the background of this card using the new Cuttlebug folder called candy cane stripes. The bench is a separate stamp from CC Designs. Perfect for the sitting down character stamps that they have in the line. The snowflake is a Martha Stewart punch that I bought last year and I haven't seen it around this year. Well, I'm off to City Mill to look for a screw. Hope they have it so I can fix a machine for one of the customers. Thanks for stopping by today and hope you're enjoying your day!!! Very Sweet card! I love red & blue for Christmas more then the traditional red & green. Hope you are having a great week. This image is so cute! Guess your copic collection will be growing huh! Hope to see you next week...it's been over 2 weeks can you believe it? lots to catch up! Ahhh this is so cute! Those copics sure are addicting, lol! I just went to J's with Joy and picked up some of these new CC design images, they are too cute! so glad that Cliff got those CC designs in! now only if he'd bring in the greeting farm too! love your card with the cute image! she is so sweet! gotta get a move on with Christmas right around the corner! have a great week!